The NFL like all major sports leagues is more of a money machine than it is about sports. The football season has been a delight for me so far. I could not tell you who is in the playoffs, who is considered the leading favorite for the Super Bowl, what players are doing what and even the Bucs dismal season has had little effect on me. I have managed to avoid the playoffs so far, so I have no idea who is sponsoring them or what networks they are on. My streaming service does not offer ESPN or the NFL Network, and that’s why I picked it. And, we are still avoiding products from manufacturers and companies that openly support the NFL. As I have stated before, I don’t care if the players kneel, jump up and down or lay on the ground kicking and screaming during the national anthem, it does nothing for me regarding their purported “causes” in fact, I think it does much more harm than good. And I certainly do not have to support the advertisers who pay the NFL loads of cash for commercials. Apparently, I am not alone. I have been keeping a running total of the dollars we diverted from known NFL sponsors, and it currently is approaching $4000. Not much in the great scheme of life, but we have been out of the big-ticket purchases up to now. 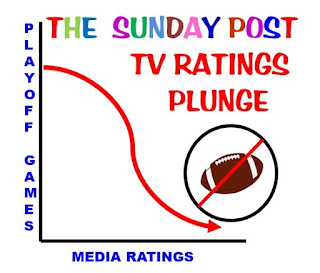 The NFL like all major sports leagues is more of a money machine than it is about sports and when the money starts to dry up, the people that really make the sports money begin to panic. Take the Super Bowl. The commercials for that along with the rates the advertisers will pay are all set over a year in advance, but the smart advertisers have a performance requirement in their contracts. Simply put a specific number of viewers, or they get some money back. Let’s hope enough people take the Super Bowl off and send the NFL a real message. If your reading this early Sunday why not go to a movie with the family, get the Star Wars Trilogy, NEMO or a couple of Indiana Jones flicks and watch it Sunday afternoon, with the kids, or the ultimate crank up the fireplace and curl up with the newspaper or a good book. We are starting to make some plans for no football Super Bowl party. Not only no football but no TV period. We are thinking road trip, but nothing is firmed up yet. I'll keep you posted.